I’ve been on a cauliflower kick for a bit now. Love this! 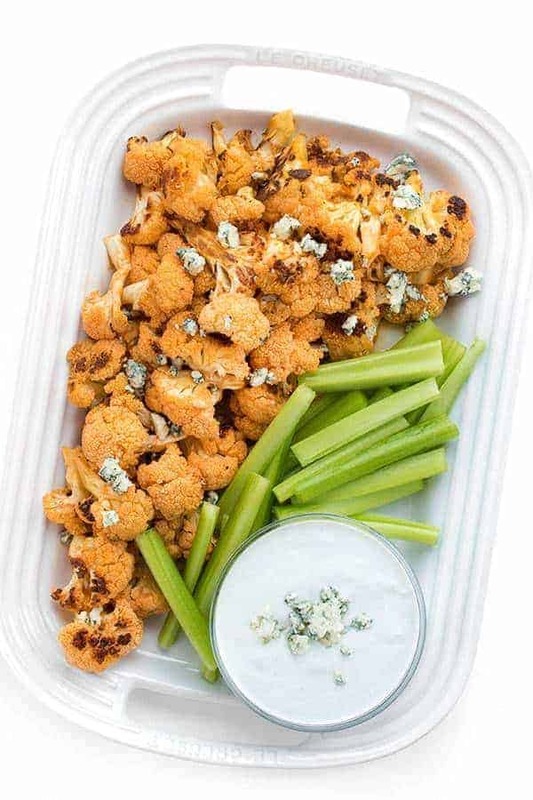 I’ve never tried pureeing cauliflower for mac n cheese but this looks absolutely amazing – will try soon! Thank you for sharing! Love the healthy spin you put on this, so delicious! He doesn’t like macaroni cheese?! Whaaat! I’ll have his portion :D this version looks great! I know right? He’s crazy! I am always up for healthifying my favorite comfort foods! This way it’s like a double win when you eat it…you satisfy your cravings WITHOUT breaking the calorie bank. I bet I could fool the.boy with this creamy cauliflower sauce! My boys loved it and had no idea there was cauliflower!! What a great way to enjoy the best comfort food with no guilt!! Guilt free is my middle name, sista! All the mac & cheese!! I love this crunchy topping! So funny, I made something similar a few weeks ago – love using cauliflower as a creamy substitute in all sorts of dishes. This looks fantastic Liz! What a delicioious way to use cauliflower! Love the cripy panko topping it looks very tempting. The crispy panko makes it! 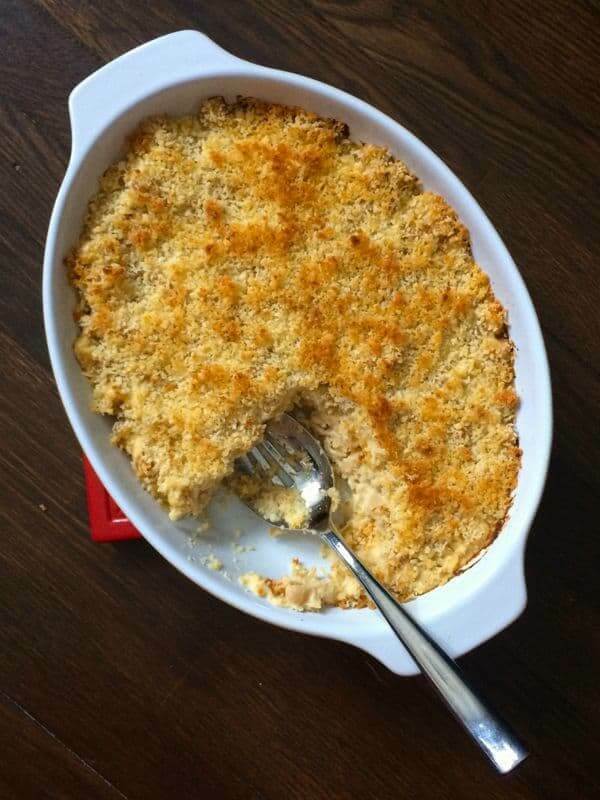 I love all thing cauliflower, and that panko-parm crust….I want this now. Love this recipe, Liz! LOVE the sneaky veggies in here Liz! Nothing floats my boat like lightened up comfort food. This looks delicious! I love cauliflower in mac and cheese so I’m definitely going to have to try this one! This is a genius idea! A whole head of cauliflower – gotta try this! Love your mac and cheese, Liz!! I am having so much fun checking out all the mac and cheese mania posts! I love sneaking veggies in! The panko topping looks awesome too! Panko/Parmesan crust FTW< liz. And who loves cauliflower? ^^^ This gal. I want to taste it!! Dude the crust just takes it to the next level!! So excited to try this! I’ve been waiting to make a cauli recipe FOREVER! This looks amazing! I hope you try it!!! 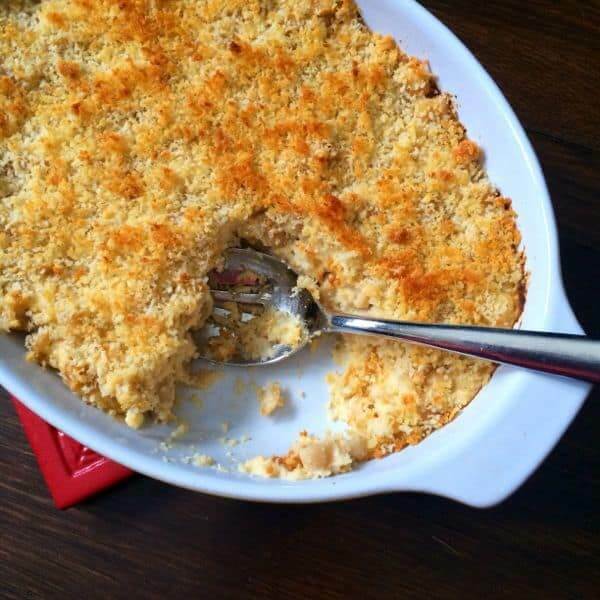 I absolutely love cauliflower and always try to sneak it into my veggie mac and cheese. . I love this recipe! Oh yes!! 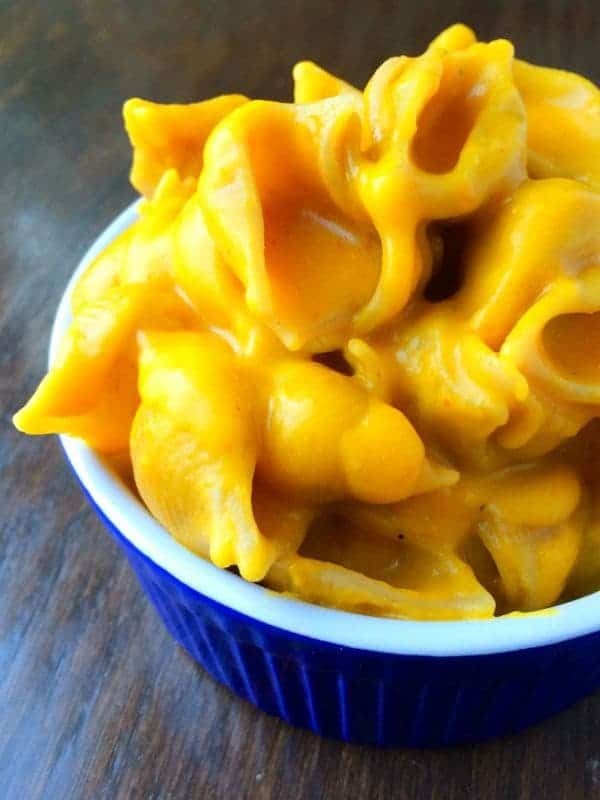 Love this skinny trick for mac and cheese! I love that you used cauliflower in this dish. It looks great Liz. I can’t quit the white veg!! Whoa! LOVE that there’s an entire head of cauli in there. I want to dive in! Heck yes sista!!! Wishing I had added blue cheese now that I saw yours!! This is absolutely my kind of mac n cheese! I always eat cauli “mashed potatoes” but would have never thought of putting it in Mac and Cheese! You, girl, are brilliant! And I love the crispy topping. It’s not mac n’ cheese without crispy topping! Omg I love cauli mashed “potatoes”!!! Need to make those again soon. I have been in LOVE with cauliflower sauce lately. It’s so smooth and creamy. Cannot get enough! Thank you so much for helping us kick off the event, you’re the best! Yes Please!!! That sounds incredible! I love stuff with a crunch, so this makes mac and cheese even better!! I think I may make that this week. As I am in my intense part of my training for the half marathon, running 75 miles a week, I need to keep my carbs up, but I can enjoy some delicious meals. This is coming to my belly very soon!!! Thanks! Wow good luck with your training!! So incredible! YUM! i have a head of cauliflower that needs to be used – this looks perfect!! This is perfect for that!! Oh Rich….no mac and cheese either?! So glad he still liked this version. Looks phenomenal! LOL He will eat a whole roasted fish but not mac and cheese. Or tacos. Or chili…. I like horseradish in leui of mustard. Otherwise just add more cheeses!! I swear you won’t taste it!